Although patch isolation and patch size have long been considered the two primary parameters affecting metapopulation processes, patch quality is now recognized as a third factor. The extent to which patch quality influences between-patch migration processes and local population sizes, however, is poorly understood. Using a mark–recapture survey for the butterfly Minois dryas, which inhabits grasslands in a fragmented landscape, we investigated factors affecting immigration and emigration of female individuals between patches. For patch quality, we assessed the proportion of forest-edge length along the patch periphery, as well as nectar resource availability, as the former is known to provide shelter from heat stress for grassland butterflies in midsummer. Results revealed that immigration into patches was largely determined by patch quality represented by forest–grassland adjacency, in addition to patch isolation. Emigration was lower from patches with high-quality measured by nectar resource availability as well as the amount of surrounding forest. These results suggest that a forest–grassland boundary is important, even for grassland-dwelling butterflies, in fragmented landscapes, and that conservation priorities should be given to habitats having this structural feature, as well as large patch size and high connectivity. 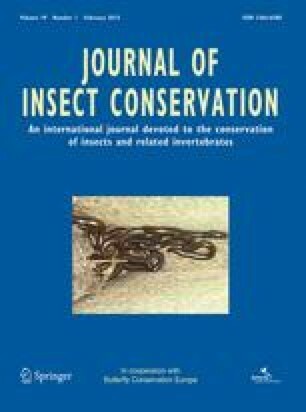 The online version of this article (doi: 10.1007/s10841-014-9732-7) contains supplementary material, which is available to authorized users. We thank Korehisa Kaneko and members of the Laboratory of Biodiversity Science (The University of Tokyo) and the Laboratory of Community Ecology (Chiba University) for help with the field work. This study was in part financially supported by the GCOE program (Asian Conservation Ecology) from the Ministry of Education, Culture, Sports, Science and Technology of Japan, and by the Ministry of the Environment, Japan (S-9).